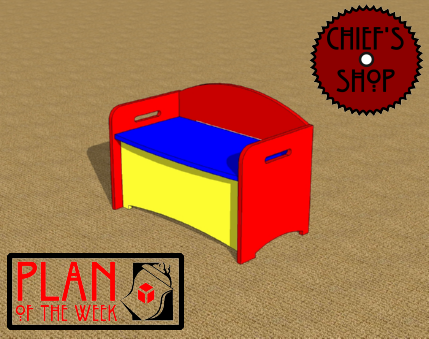 The Chief’s Shop Toy Box Stool provides storage and seating and is sized just right for little ones, whether it’s your child or grandchild. It can be a Christmas present, or be a place to store the presents after the bid day. The lid serves as the seat (make sure you attach a safety hinge) and one sheet of plywood is all the lumber you need. Overall dimensions: 30 inches wide x 16 inches deep x 21 7/16 inches high (at the back): 13 1/2 inches high (at the seat). You’ll need a table saw or circular saw, jigsaw, drill driver, and Kreg Jig to build it.